(Photo: Albin Hillert / WCC)Rev. 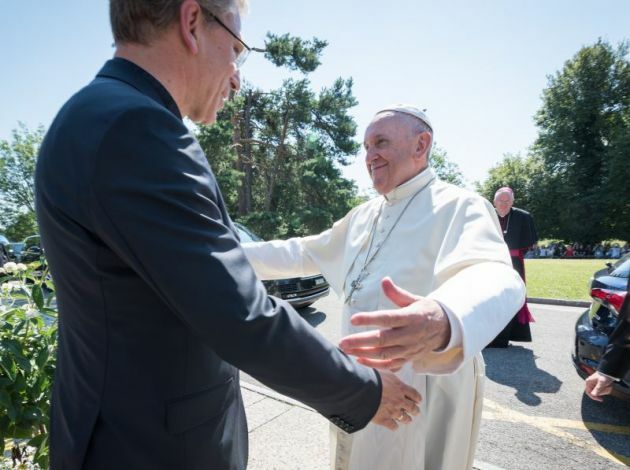 Olav Fykse Tveit, general secretary of the World Council of Churches greets Pope Francis on his first papal visit to the WCC's Ecumenical Center in Geneva, Switzerland on June 21, 2018. The thirst for material things blinds human beings to their companions and that indifference abounds in the world's streets today, Pope Francis said in a homily at the World Council of Churches in Geneva. Swiss government officials including Alain Berset, who holds the rotating Swiss presidency this year, welcomed him at Geneva's international airport. Berset told journalists that he shares the Pope's commitment to peace and human rights. At the WCC's Ecumenical Center on June 21, Pope Francis spoke about walking towards Christian unity and the pitfalls that we encounter on the journey. "For us as Christians, walking together is not a ploy to strengthen our own positions, but an act of obedience to the Lord and love for our world. Let us ask the Father to help us walk together all the more resolutely in the ways of the Spirit," said the Pope. "I wanted to take part personally in the celebrations marking this anniversary of the World Council, not least to reaffirm the commitment of the Catholic Church to the cause of ecumenism and to encourage cooperation with the member churches and with our ecumenical partners. "Whenever we say 'Our Father', we feel an echo within us of our being sons and daughters, but also of our being brothers and sisters. Prayer is the oxygen of ecumenism," said Francis. The landmark visit of Pope Francis to the World Council of Churches on 21 June is the cornerstone of the ecumenical commemoration of the WCC's 70th anniversary. Pope Francis' day at the WCC began with an ecumenical prayer service in the chapel of the Ecumenical Centre from where he delivered his homily on "walking the ecumenical journey." Founded in 1948, the WCC brings together 550 million Christians from Orthodox, Anglican, Methodist, Baptist, Lutheran and Reformed churches. Although the Roman Catholic Church is not a WCC member it is a member of the WCC's Faith and Order Commission and the two cooperate on many matters. "The World Council of Churches was born in service to the ecumenical movement, which itself originated in a powerful summons to mission: for how can Christians proclaim the Gospel if they are divided among themselves?" said the Pope. "The missionary mandate, which is more than diakonia and the promotion of human development, cannot be neglected nor emptied of its content. It determines our very identity." Present during the homily were WCC general secretary, Rev. Olav Fykse Tveit, Dr Agnes Abuom, the moderator of the WCC's central committee, and committee vice-moderators Bishop Mary Ann Swenson and Metropolitan Gennadios. They were joined by members of the central committee, one of WCC's main governing bodies. Official contacts between the Roman Catholic Church and the WCC date from the early 1960s, following the decision by Pope John XXIII in 1959 to convene the Second Vatican Council. In his homily delivered in the WCC Chapel, Pope Francis said human beings are constantly on the move, while noting that walking is a discipline needing "patience and exercise, day after day." 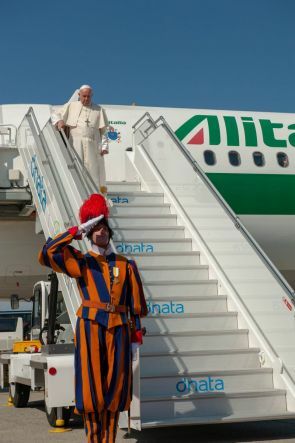 (Photo: Joanna Lindén-Montes)Swiss guard salutes as Pope Francis step from his plane on arrival in Geneva for a visit to the World Council of Churches on JUNE 21, 2018. He cited the Apostle Paul's epistle to the Galatians (5:16) saying, "We can either walk in the Spirit along the path opened up by our baptism or else we can 'gratify the desires of the flesh'." Francis said, "Driven by our instincts, we become slaves to unbridled consumerism, and God's voice is gradually silenced. "Other people, especially those who cannot walk on their own, like children and the elderly, then become nuisances to be cast aside. Creation then comes to have no other purpose than to supply our needs," he said, speaking the day after World Refugee Day. Francis noted that in the course of history, divisions between Christians had often arisen because "at their root, in the life of communities, a worldly mindset has seeped in." "Ecumenism made us set out in accordance with Christ's will and it will be able to progress if, following the lead of the Spirit, it constantly refuses to withdraw into itself," he said. Later the pontiff joined the WCC general secretary and the moderator of its Central Committee at an ecumenical meeting during his landmark 21 June visit to the WCC to celebrate its 70th anniversary at an ecumenical meeting in Geneva. WCC general secretary Tveit said, "This day is a landmark. We will not stop here. We will continue, we can do much more together for those who need us." The theme of the visit is an "Ecumenical Pilgrimage - Walking, Praying and Working Together" and the meeting began with a prayer service at the Ecumenical Centre chapel. "Your Holiness, your visit is a sign of this hope we share. It is a milestone in the relations among the churches. We are here as representatives of different churches and traditions from all over the world," said the general secretary. In 2017, Roman Catholic and Protestant Lutherans jointly commemorated the 500th anniversary of the Reformation which split a major part of Christianity apart when Martin Luther led protests over practices by the church that reverberated for centuries. Geneva was an important city in the Reformation. But 500 years before that, the Great Schism of 1054, when the Greek Orthodox Church officially split with the Catholic Church, had also split Christianity. Tveit noted, "By walking, praying and working together during these last 70 years, we have learned much about what it means to be a fellowship of churches. "That is also how the relationship has developed between the WCC and the Roman Catholic Church after more than 50 years of cooperation." He explained that the profile of the work of the WCC and many of our partners today is "being together on a Pilgrimage of Justice and Peace." Tveit said the WCC and the Catholic Church work together for joint peace initiatives in many places in the world as they address the situation of refugees along with issues of economic justice and dealing with poverty. "We work hard together to combat climate change and other threats to our environment. We promote inter-faith dialogues and initiatives for peace. We mobilize together for the Sustainable Development Goals. We prepare the annual prayers for Christian unity together."